The CQWW DX Competition would have to be the biggest radio contest of the year for the casual contester such as myself. It is also important reminder that you need to be under no illusion of the capabilities of your equipment, otherwise you may quickly find yourself very frustrated. This is my first crack at CQWW since 2011, and I have entered with the goals of beating my 2011 score of 2160 and working some new countries. 0000 UTC is 1100 AEDT so I allowed myself to sleep in, get up and get ready. I was on the mic and ready to go as the clock ticked over to start time. So you can imagine my early frustration when I couldn’t make a contact. I could hear the stations just fine, but they could not hear me. It actually made me question whether my station had suffered a critical failure while I was sleeping and was not transmitting at full power. Truth of the matter was that my station is quite meagre compared to many of the other stations on air and 100 watts into a dipole that is barely above ground level, along with an ordinary geographical location means that I simply do not have the power to punch through closed bands, I need to wait for them to open. So I went outside to do some gardening. The 20m band finally opened for me around 0500 UTC and from then on it was search and pouncing for the next 3-4 hours, occasionally listening on 15m. As usual, it seems the bulk of my contacts come from CQ Zone 15, though I was pleased to work USA later in the evening on 40m. Definitely the highlight of the evening was working VP2MDG in Montserrat late in the evening on 20m. The band should have been closed at that hour, but he was booming in! Sunday followed much the same pattern as Saturday, except the 15m band was not really open for me this time around. by 0700 UTC I had become tantalisingly close to a 10,000 point score, with less than 500 point required. To my frustration, the 20m band started to close up at the same time, and those last 488 points took 1 hour to make with 2 QSOs. At 0834 UTC on 25/10 I finished up my competition operations with a total claimed score of 10,602. It was very much a battle of the linear amplifiers for many people, and I was amused to hear many of the splatter in some cases over 5-6KHz across the band, which is not something you are meant to do. Some lessons were learnt this year, and I think next year I may take my station mobile to gain some crucial elevation. I think by next year a significant amount of servicing will be completed to my feed lines and antennas to ensure they are working at an optimum level. Definitely what I thought was going to be a simple contest was anything but. In recent years online QSL services such as eQSL and the ARRL Logbook of the World would have you believe that confirming DX QSOs has moved into the electronic world and QSL cards are no longer required, however I still find it quite enjoyable to receive real paper QSL cards in the mail – I think its a lot more personal knowing that someone has gone to the effort of sending you a card rather than having a computer automatically generate a message and upload to the internet. 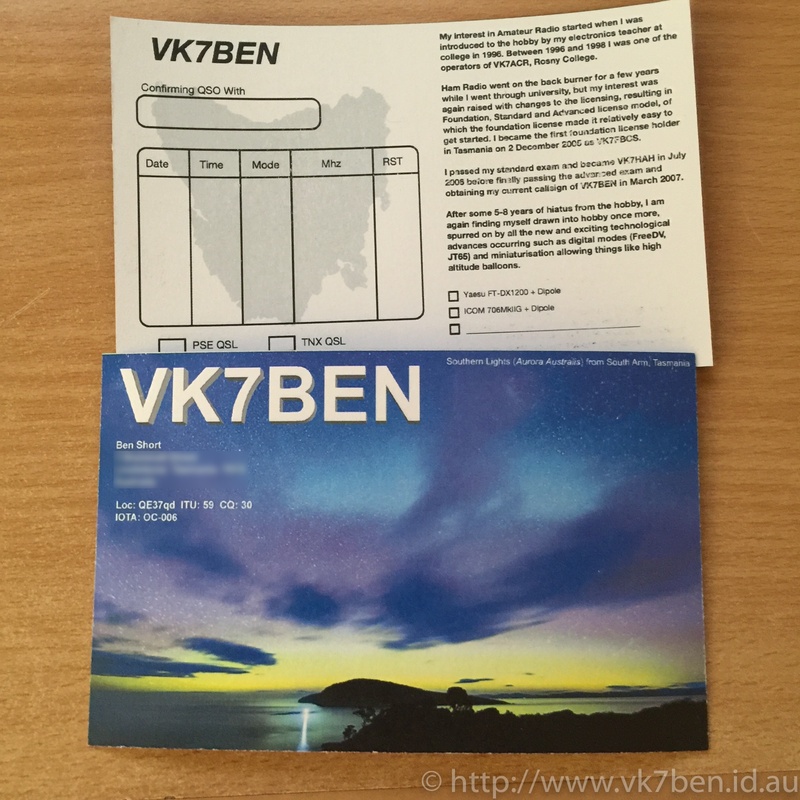 I’m not the only one, with local operator VK7GN having an amazing QSL collection that was featured on TV. It’s been a long time since I made up QSL cards. My last QSL cards were single sided, with 1/3 of the card taken up by a picture of my IC-706MkIIg and the brief information and QSO details. This was printed onto matte 4×6 photo paper and I wrote on them and sent when QSL cards were received. I wasn’t terribly happy with these as they felt a little cheap and flimsy, and were not the standard QSL card size of 140mm x9 0mm. Following the OCDX Contest I felt it was inevitable that I would start receiving QSL cards again and that I should have some QSLs cards of my own to reply with. I started by searching the web for QSL card printers, and while many were out there the pricing was getting expensive (the $AUD has *tanked* in the last 12 months) and not being sure of the quantity I required it was a bit of an undertaking, so I decided to create and print them myself. Using Photoshop and Pixelmator and using one of the photos I took of the Aurora Australis, I had a look around online at what some other QSL cards looked at before finishing my design. After that I had a bit of fiddling to do to get the card front and reverse to line up and fit 3 to a A4 piece of card to print. I then trimmed to size with a guillotine. I am pretty happy with how these have come out. They look good, they feel good, and I will be happy to start sending them out as QSO confirmations as I receive QSL Cards.